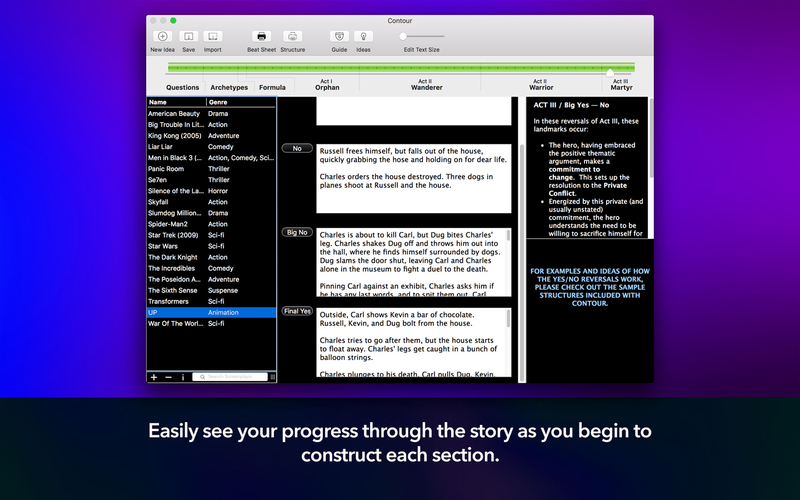 Story development system streamlines movie outlining process. Is there a better alternative to Contour? 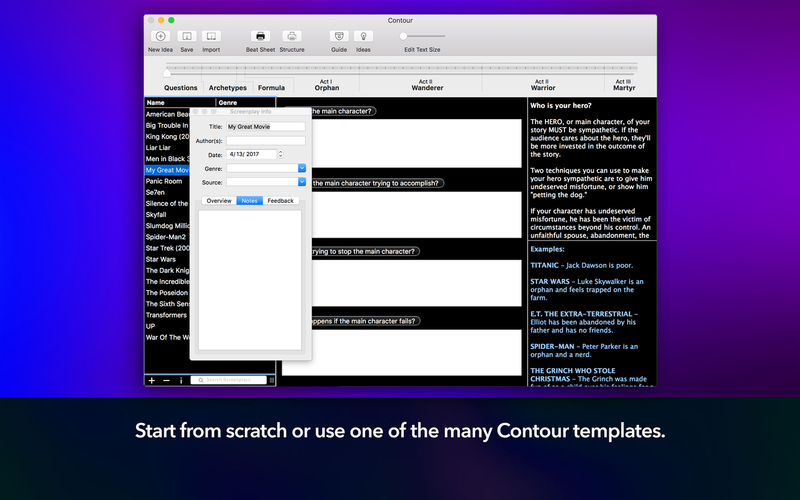 Is Contour really the best app in Word Processing category? Will Contour work good on macOS 10.13.4? Contour was developed in collaboration with Emmy Award-nominated Jeffrey Alan Schechter; Contour is a proven, fill-in-the blanks story development system that has generated millions of dollars worth of writing assignments and script sales. The software uses the same character-based structure that most every blockbuster movies uses to create well-written stories from Fade In to Fade Out. Contour shows exactly what elements need to be in a script, never leaving the question, "what comes next?" Minimum Theory, Maximum Story - Unlike other story development systems which are either so complicated that you don't know where to start or so light-weight as to wonder, "why in the world did I buy this? 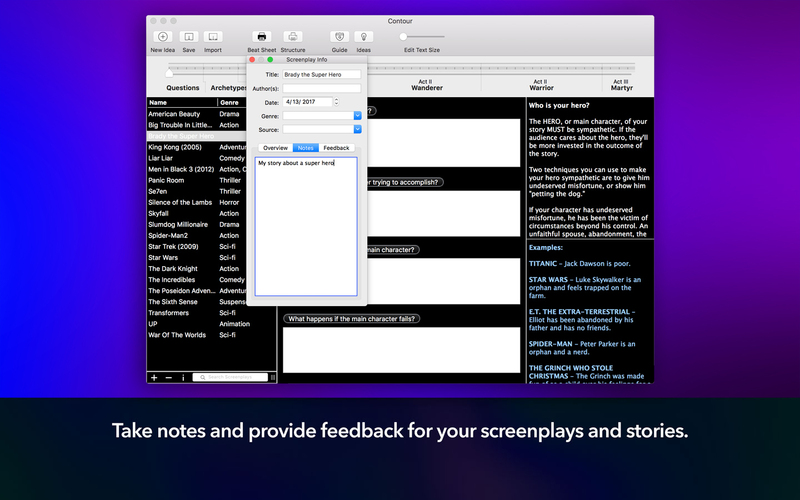 ", Contour is a must-have for every screenwriter. Taking your idea and using a fill-in-the blanks and intuitive approach, Contour guides you as to what elements need to be part of your story outline - you're never left to wonder, "what comes next?". That's it - fade out, roll credits. Shhh! It's a Secret! 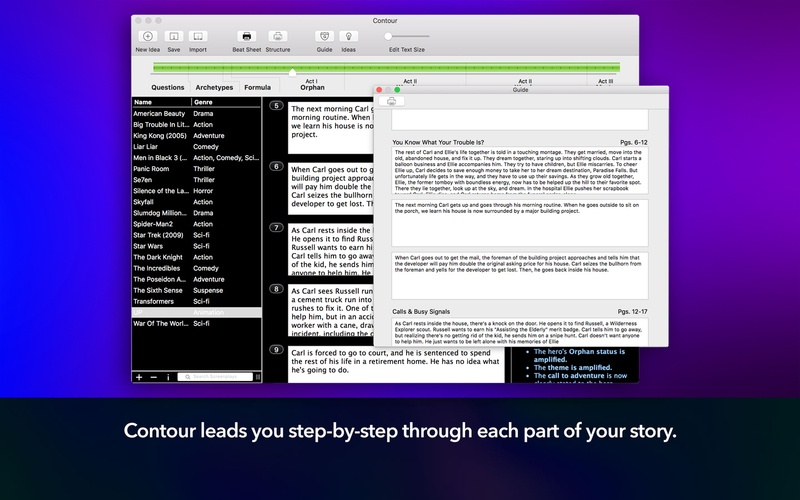 - Contour explains the major storytelling secrets needed to craft a highly marketable movie. Your main character's journey is explained through archetypal themes - the same kind of themes used by most of the top 50 movies that have affected millions of viewers - maybe even you!